This past weekend, Yale’s Beinecke Library opened an exhibit dear to the hearts of we gently mad. 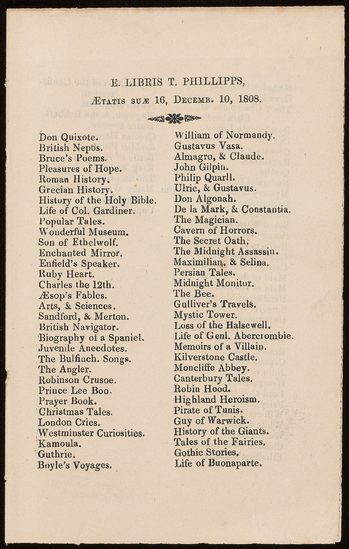 Even its title is a draw: Bibliomania; or Book Madness: A Bibliographical Romance, taken from Thomas Frognall Dibdin’s 1842 book on the topic. The exhibition is divided into four distinct parts, as it explores the relationships of readers, owners, authors, and collectors. Every Book in the World! tells the story of the legendary nineteenth-century bibliomaniac (emphasis on the maniac), Sir Thomas Phillipps, whose massive collection of manuscripts and early printed books numbered well over 100,000 items. Pictured above: “E Libris T. Phillipps, Aetatis suae 16, Dec. 10, 1808,” from Books, tracts, leaflets and broadsides printed by Sir Thomas Phillipps at his private press at Middle Hill. Courtesy of the Beinecke Library. Collated & Perfect, organized in conjunction with the Harry Ransom Center, at the University of Texas, Austin, explains the history of collation and the the quest to find a more perfect text -- including the work of Charlton Hinman, editor of the first folio edition of Shakespeare’s plays (1968) and inventor of the Hinman Collator. Pictured above: The Tragicall Historie of Hamlet, Prince of Denmarke by William Shakespeare (1604). Courtesy of the Beinecke Library. Habits Ancient and Modern: Surface and Depth in the Pillone Library Volumes delves into a fascinating family library assembled in Italy in the sixteenth century, and the decision to have the fore-edges of many of their volumes painted by Cesare Vecellio, a distant cousin of Titian. 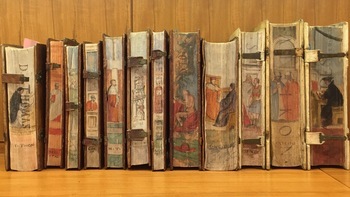 Pictured above: Fore-edge paintings by Cesare Vellecio on volumes from the Pillone Library. Courtesy of the Beinecke Library. The Whole Art of Marbling offers a sampling of the Beinecke’s vast and beautiful collection of marbled papers to illuminate the art’s history, techniques, patterns, and practitioners. Pictured above: “Silhouette,” plate 22 in Marbled Papers by Christopher Weimann (1978). Courtesy of the Beinecke Library. The exhibition is on view through April 21. Related events are listed here. This past weekend, Yale's Beinecke Library opened an exhibit dear to the hearts of we gently mad. Even its title is a draw: Bibliomania; or Book Madness: A Bibliographical Romance, taken from Thomas Frognall Dibdin's 1842 book on the topic. The exhibition is divided into four distinct parts, as it explores the relationships of readers, owners, authors, and collectors. Every Book in the World! tells the story of the legendary nineteenth-century bibliomaniac (emphasis on the maniac), Sir Thomas Phillipps, whose massive collection of manuscripts and early printed books numbered well over 100,000 items. Pictured above: "E Libris T. Phillipps, Aetatis suae 16, Dec. 10, 1808," from Books, tracts, leaflets and broadsides printed by Sir Thomas Phillipps at his private press at Middle Hill. Courtesy of the Beinecke Library. Collated & Perfect, organized in conjunction with the Harry Ransom Center, at the University of Texas, Austin, explains the history of collation and the the quest to find a more perfect text -- including the work of Charlton Hinman, editor of the first folio edition of Shakespeare's plays (1968) and inventor of the Hinman Collator. 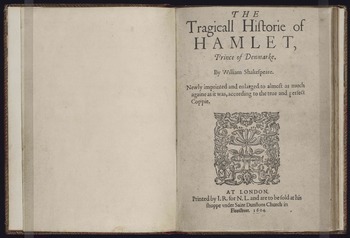 Pictured above: The Tragicall Historie of Hamlet, Prince of Denmarke by William Shakespeare (1604). Courtesy of the Beinecke Library. The Whole Art of Marbling offers a sampling of the Beinecke's vast and beautiful collection of marbled papers to illuminate the art's history, techniques, patterns, and practitioners. 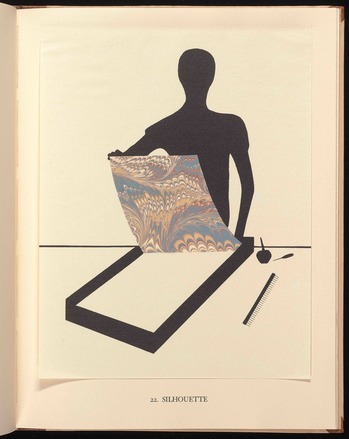 Pictured above: "Silhouette," plate 22 in Marbled Papers by Christopher Weimann (1978). Courtesy of the Beinecke Library.